Groundbreaking research isn’t just done by scientists, doctors, and experts in secluded laboratories; fascinating discoveries are made every day by undergraduate researchers at universities around the world. With students working so hard at their research while balancing their coursework and personal lives, it seems only right that their hard work should be acknowledged and honored by the university that sponsors it. 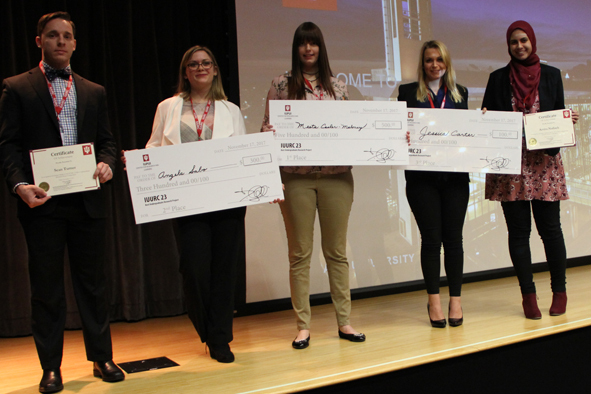 The Indiana University Undergraduate Research Conference (IUURC), hosted by the Center for Research and Learning, gives students the opportunity to demonstrate their findings, gain recognition, and even win awards for their research. Even after the hypotheses are evaluated and results are recorded, the research process continues; communication and discussion are vital to complete the cycle of knowledge-seeking. Undergraduates should not only be able to perform research, they must know how to share it with others in a clear and effective way. The IUURC began in 1994 to allow students at every Indiana University campus to come together and share knowledge. This is an important step in students’ research careers, and one that, while it may be daunting, is ultimately rewarding. When students interact with other researchers and interested students, and they see how their work can impact and interest others, it encourages them not only to continue their projects, but also to take pride in what they have already accomplished. In addition to honoring undergraduate researchers, the IUURC is also to honor the mentors, faculty members, and staff researchers who have given their students opportunities and guidance to explore the world around them and discover its mysteries. During the event, undergraduate researchers, with the support of their mentors, showcase their work through oral or poster presentations. Past IUURC’s have included roundtable presentations where undergraduates participate in discussion of their methods and results. Attendees may view the schedule of events and the abstracts so they may plan what research they wish to examine more closely. The Indiana University Undergraduate Research Conference lets attendees tap into the pulse of IU research, get inspired for their own research, and network with others who have the same interests and dreams for their future. The event takes place this Friday, November 16th, in the IUPUI Campus Center. All are welcome and encouraged to attend. This year’s researchers are sure to showcase some amazing work that you won’t want to miss.